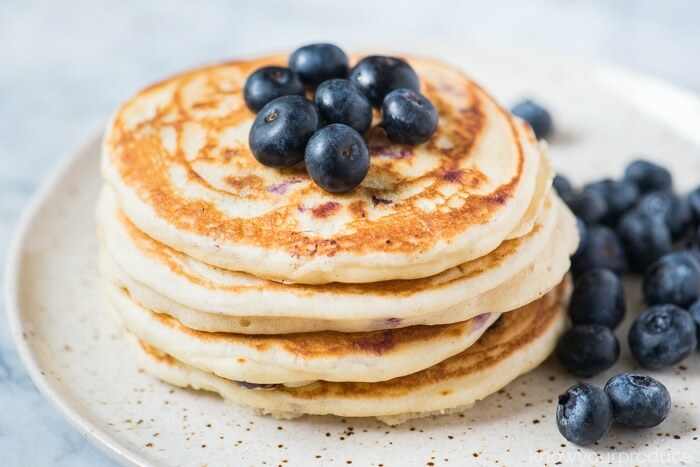 Blueberry Pancakes with fresh blueberries is a must make breakfast recipe. Double the batch to have extras to freeze for later. 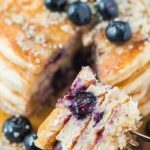 We make these blueberry pancakes using our tried and true basic pancakes recipe. 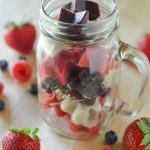 You can add in strawberries, bananas, apple bits, or even chocolate chips. 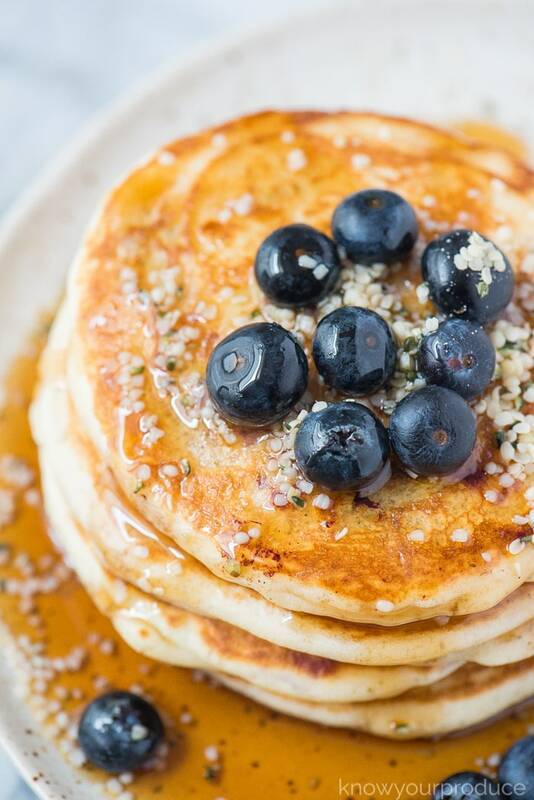 Put whatever fillings you want in these pancakes, but our favorite is fresh blueberries! During the spring and summer, we add in some fresh lemon zest or orange zest to brighten it up. Since it’s fall we add in some cinnamon, don’t worry, it tastes delicious and it’s a subtle flavor enhancement. This is not a buttermilk pancake recipe per say, but we do use a buttermilk substitute. Mix 1 cup of milk minus 1 tablespoon with 1 tablespoon vinegar OR 1 cup of milk minus 1 tablespoon plus 1 tablespoon lemon. This method will also work for soy milk and almond milk. Place the flour, salt, cinnamon and baking powder into a large bowl. In a small bowl combine the milk and vinegar (or lemon juice) and allow it to sit for 5 minutes, this will curdle the milk and turn it into buttermilk. Pour the buttermilk mixture, maple syrup, vanilla, egg, and coconut oil into the bowl with the dry ingredients and whisk until combined. Let the pancake batter sit for 5 minutes once mixed so the baking powder can fully activate, this is what creates fluffy pancakes. Another option for extra fluffy pancakes is to whisk the egg white and gently fold it into the batter. Once the batter is ready, heat a skillet with a little coconut oil or butter. 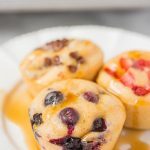 Place about 1/3 cup of pancake batter onto the pan and top with a few blueberries. The pancake is ready to flip once it’s starting to bubble on the surface. Gently flip the pancake and cook until both sides are browned. 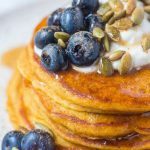 can you make blueberry pancakes with frozen blueberries? 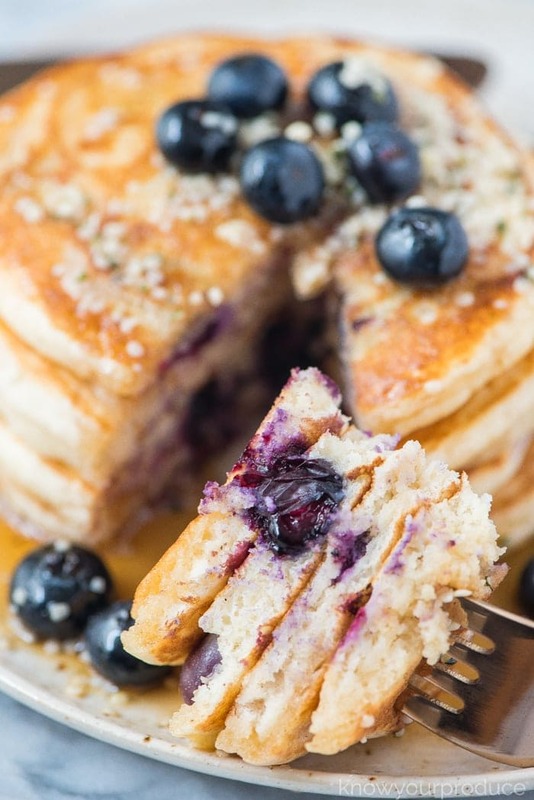 Yes, you can use frozen blueberries for this pancake recipe, but we prefer fresh. Frozen fruit tends to be a bit more watery. Yes, you can easily freeze pancakes. Place them on a sheet pan and freeze until frozen solid. This prevents them from sticking together. Once they’re frozen they can be stacked together. Store them an airtight freezer container. Our pancakes are lightly golden brown if you want them darker use a little more melted butter in the pan and instead of medium heat, go medium-high heat. 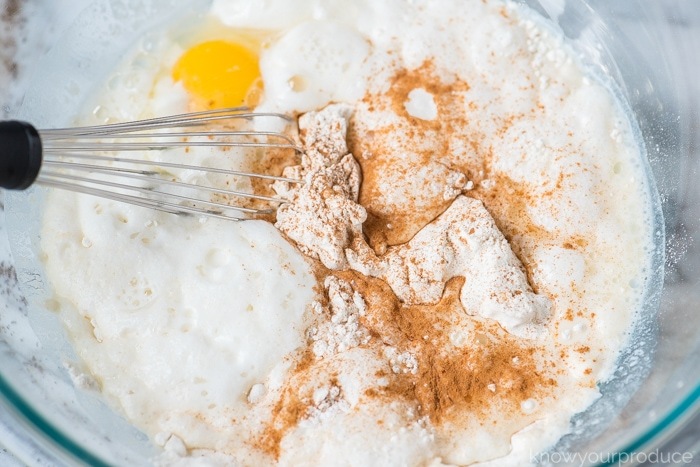 We don’t recommend mixing pancake batter in a stand mixer, instead, we suggest a mixing bowl and whisk. 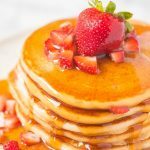 This is an easy pancake recipe for the entire family to enjoy eating and making together. Make it a weekend tradition, our daughter loves measuring and mixing the ingredients. She eagerly awaits for pancakes to be turned so she can flip them. Make it fun for everyone, even make them in fun shapes! you can use buttermilk if you have it on hand, otherwise, use the buttermilk substitute. swap out the coconut oil for other fats, you can use melted butter or vegetable oil. 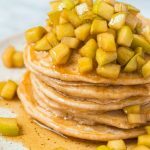 to make these dairy free you can use coconut milk, almond milk, or soy milk, these will all work with the buttermilk substitute method as well. if you don’t want to add maple syrup into the mix you can use your preferred sweetener. 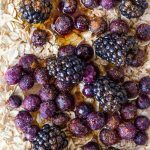 frozen blueberries will work in this recipe, just use the same amount as you would fresh. add flavor additions like fresh citrus zest, lemon or orange works well. 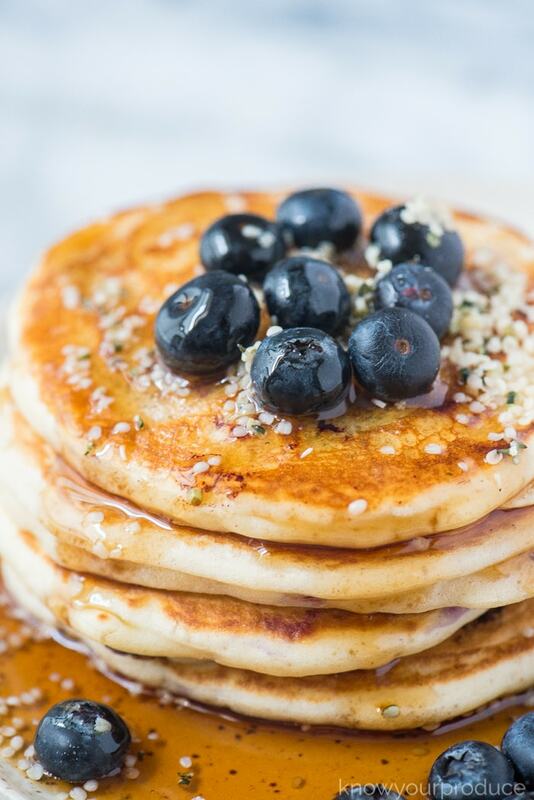 keep cooked pancakes warm in the oven while you’re making the rest – we keep them warm in our oven at 250 degrees F.
Place the flour, salt, cinnamon, and baking powder into a large bowl and set aside. In a small bowl combine the milk and vinegar (or lemon juice) and allow it to sit for 5 minutes. 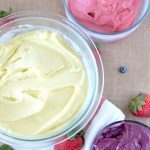 Mix the buttermilk mixture, maple syrup, vanilla, egg, and coconut oil into the bowl with the dry ingredients and whisk until fully combined. Let pancake batter rest for 5 minutes once mixed so the baking powder can fully activate. Once the batter is ready to cook, heat a skillet with a little coconut oil or butter. Place 1/3 cup of pancake batter onto the pan and top with a few blueberries. Gently flip the pancake once ready and cook until both sides are browned. if you don't want to add maple syrup into the mix you can use your preferred sweetener. 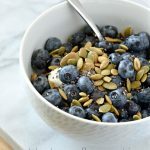 frozen blueberries will work in this recipe, just use the same amount as you would fresh. add flavor additions like fresh citrus zest, lemon or orange works well. keep cooked pancakes warm in the oven while you're making the rest - we keep them warm in our oven at 250 degrees F.